Natural position of hands, which facilitates the control of the nozzle and its movements. Progressive opening and closing of the slide valve through a large trigger. Double Jet Flash Over at different angles to operate at a short or long distance. Automatic closing of the nozzle in case of a fall during its use, and protection of the hand and the trigger by a large sized removable bridge. 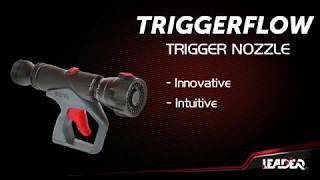 Ideal for Pulsing, TRIGGERFLOW Regular nozzle brings a revolution to the firefighting area. Its design makes it safer, more intuitive and more ergonomic. One hand holds the nozzle and controls the flow rate with the fingertips, and the other hand manages the jet pattern and will withstand the recoil force if necessary. A complete control of the nozzle without the need to move the hands! TRIGGERFLOW nozzle with large trigger is a revolution in the field of fire fighting. It allows to control the flow rate with the fingertips! Combining compactness and performance, PARTNER 2 portable monitor offers a flow rate of up to 3000 l/min.